The Ambassador of India to the Republic of Maldives, H.E. 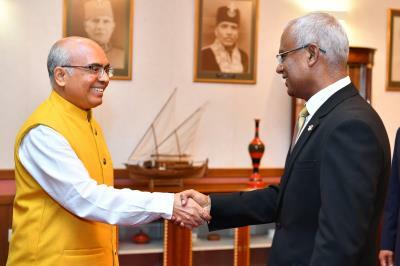 Akilesh Mishra, paid his farewell call on President Ibrahim Mohamed Solih this morning at the President’s Office. 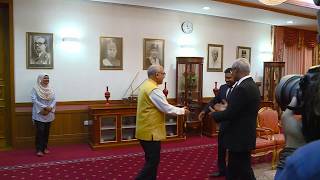 The President conveyed profound thanks to the Ambassador for his remarkable services during his tenure, to further cultivate the historic ties between the Maldives and India. While noting the Ambassador’s close working partnership with the Maldives, the President highlighted with appreciation the Ambassador’s familiarity with the Maldivian language, customs and traditions. The President expressed his hope that the Indo-Maldives ties would continue to attain new heights in the backdrop of the renewed understanding and trust in recent months. The Ambassador emphasized that it was an immense pleasure to have served as the Ambassador of India to the Maldives and conveyed his gratitude for the close cooperation extended by the Government of Maldives for the positive step in opening a new chapter for Indo-Maldives ties. The two sides discussed the importance of maintaining the momentum of ongoing mutually-beneficial initiatives in myriad areas, including capacity-building, infrastructure development, sports cooperation and renewable energy. In closing, the President expressed his hope that the Ambassador would remain a friend to the Maldives, and wished him success and good fortune in his future endeavours.